2009 marks the 100th anniversary of the founding of Tel Aviv, the first new Jewish city in the Land of Israel for over two thousand years. By 1900, there were about 5000 Jews in Jaffa; the first decade of the 20th century was a time of active Jewish immigration to Palestine – spurred on both by Zionist ideology and also events such as the Kishinev pogrom in 1903. Although this period of what we call the 2nd Aliyah is best known for the formation of pioneering agricultural communities, in fact 4 out of every 5 new immigrants settled in a city. Before Tel Aviv’s founding, some new Jewish neighborhoods had pushed their way northward out of Jaffa to escape the overcrowding in the city. But the pressure on urban living space was on, and this led to the idea of founding a new, totally Jewish city. In 1906, three men – Meir Dizengoff the future mayor of Tel Aviv, David Smilanski a writer and Akiva Aryeh Weiss a watchmaker – held the first meeting of the “Ahuzat Bayit” Society. Weiss wrote a prospectus, in which he talked about a 100% Hebrew city, where the only language would be Hebrew, the streets would be paved, there would be sewers and electric lighting – in other words, everything that Jaffa was not ! By 1909, Ahuzat Bayit, which means “homestead”, had acquired 60 member families and plot of land on the dunes north of Jaffa. 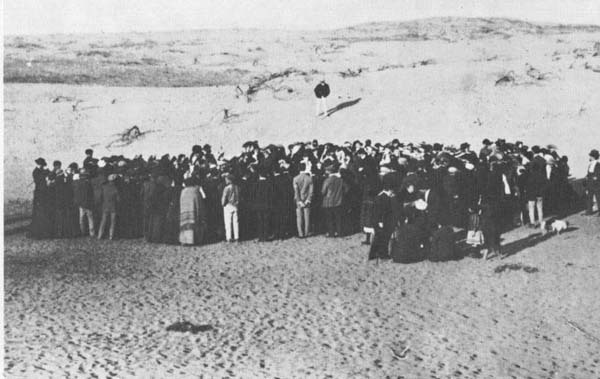 During Passover, Weiss presided over what would come to be known as the “Seashell Lottery” in which individual plots were allocated to each of the 60 families. In 2009, the five generations of descendants of those original 60 families gathered at the same spot to commemorate the founding of the city which – shortly after – was renamed Tel Aviv, the Hebrew title of Theodore Herzl’s visionary book about the Jewish homeland, “Altneuland”.